*Regular nightly rate is $399. Weekly rate is stay for 7, pay for 6. Your reservation total will include a cleaning fee and bed tax in addition to the rental rate. 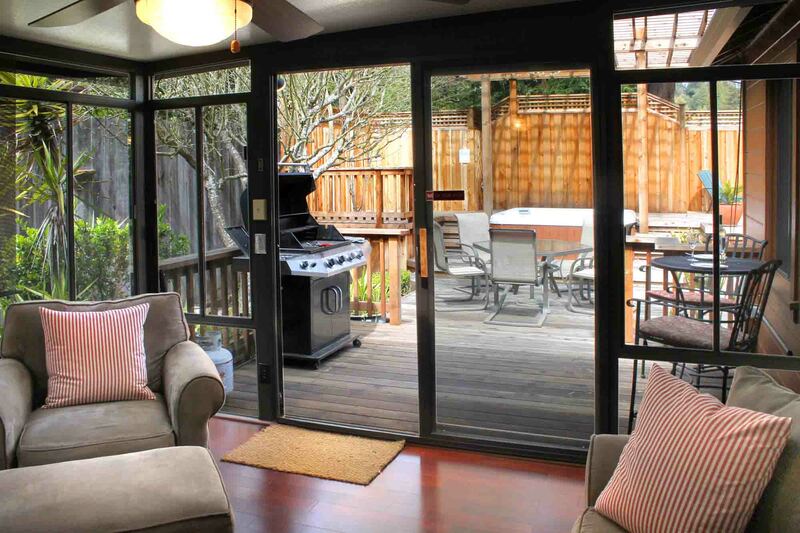 Contemporary Slice of Heaven, Plenty of Space, Central to Everything Guerneville, Central Heat, 2 Fireplaces, Hot Tub, Fenced Yard, Sunny Decks; Flat Walk (1 mi, no sidewalks) to Downtown Guerneville, River Beaches; Short Drive to Golf, Wine Tasting, Hiking, Coast. Wi-Fi, Unlimited Domestic Long Distance, Cable TV. Keyless Entry. Your Well-Behaved Dog is Welcome! 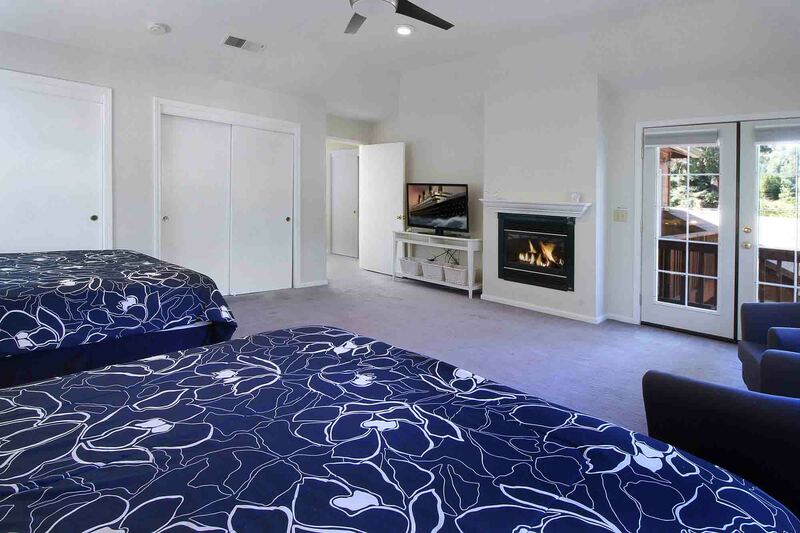 On Great Escape's ground level, there’s a living room, kitchen and formal dining room. Off the kitchen, there’s a sitting room, which opens to the large side deck with outdoor dining and hot tub. 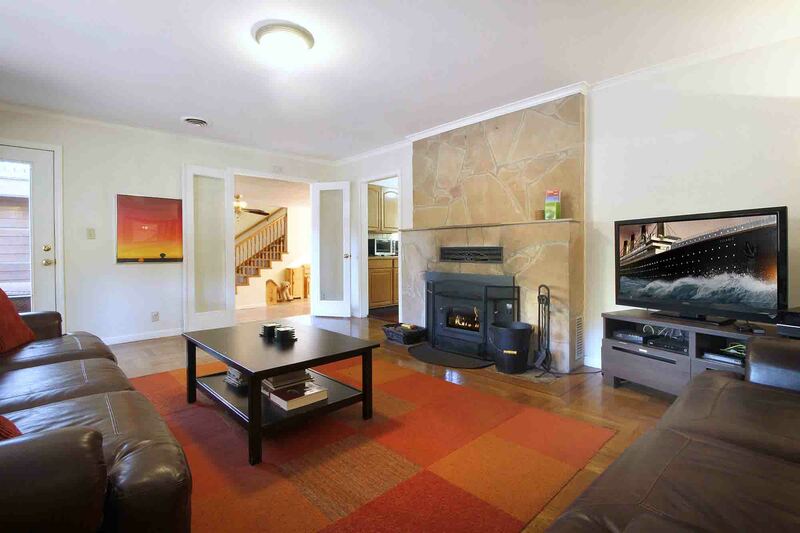 Off the living room there are two bedrooms, which also open to the deck, and one full bath. Living room and dining room open to another deck with comfortable seating. On the far side of the dining room, there’s a half bath. On the upper level, there are two large bedrooms with small balconies and a large bathroom. 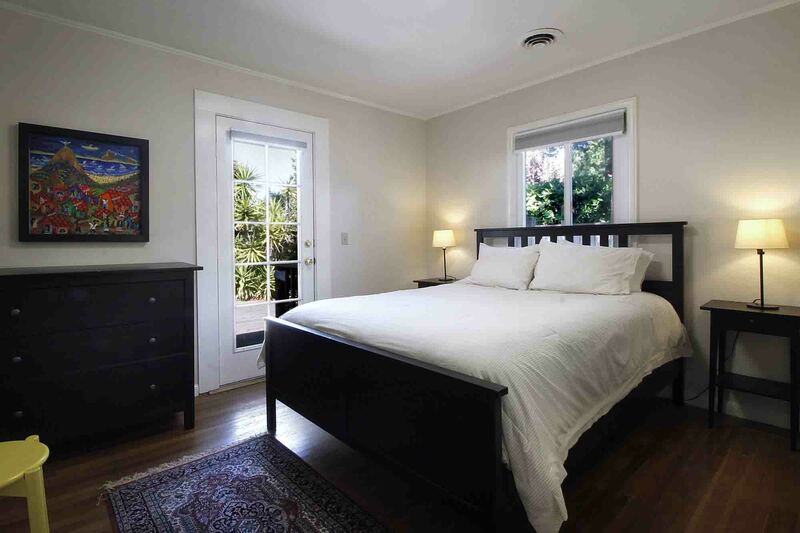 Directly outside one of the bedrooms, there’s a sleeping nook with daybed. The yard is fully fenced. House is ~2800sf. Ceiling Fans (every room except living room). NO air-conditioning. Max Occupancy: 10. Max Automobiles: 4. Quiet Hours 10pm-7am. No outdoor amplified sound at any time. House was roomy. Ants in kitchen and upstairs. The location is awesome! The house is beautiful, but would be much more usable in the summer. Hot tub is great! It felt like no one has been there in a while, despite the company being about a mile away from the house. We arrived to a cold house that took hours to warm up and dealt with ants all throughout the upstairs. It is definitely not personally owned property and there are many rules posted every where. Emily was absolutely wonderful she answered every question the house was exactly is stated, nice and clean lots of room Nice big dining room table we could all sit in we actually had 12 one night for dinner very comfortably great place to stay, will return. thanks again !!! "This is a really spacious"
This is a really spacious, comfortable and well-stocked home to stay in. There were eight in our group, and it was a perfect fit for us with ample room to sleep, cook, lounge, enjoy the hot tub, and the rooms are well insulated, so it is easy to not be bothered by people who want to stay up late and to control the temperature of the house. We would love to do it all over again! "We had a lovely family gathering"
We had a lovely family gathering over Christmas, and the house was a perfect space for us. The upstairs heat didn’t work but the agency was quick to respond and get us space heaters once we notified them, and we were plenty warm with those. The house needs a touch of TLC (electrical tape over cracks in the tile floor in dining room, back door very challenging to open and close), but we enjoyed it. The house is as good as in pics , might be better :) Had an amazing stay!! would love to come back. "The house is spacious "
The house is spacious enough for a party of 7-8 people. Good value for money. Before we checked in the hosts offered to refund us due to the Camp fire that weekend. We thought that was very gracious. The next door neighbor was watching us park our cars so make sure you do not park anywhere near her property. "This was a great place"
This was a great place, and plenty large enough for the eight (8) of us that stayed there. Close to town, and easy check-in. Would very much recommend for a large group! Awesome stay! Thanks so much for everything! Highly recommend for a group! "This house was plenty of space"
This house was plenty of space for our party of 9 and we were able to cook meals and eat together at the nice large dining table. 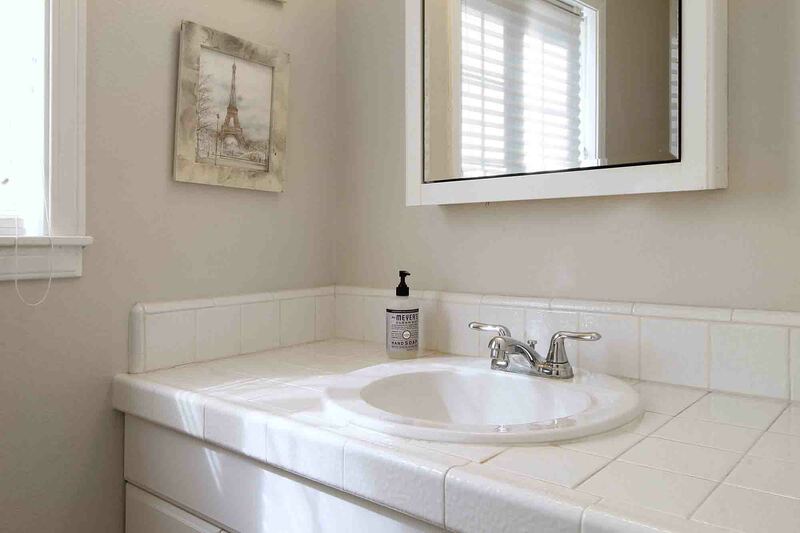 Although the house seemed more dated than what I had expected from the photos (kitchen, floors, cabinets, fences), everything was very clean and neat. Best place we have ever rented. House is great, and neighbor is delightful. Hope it will be available to us for our family get together next year! "Great Escape was the perfect vacation getaway"
The Great Escape was the perfect vacation getaway for our family! The space and amenities were exactly what we wanted. We loved having the ability to hang out, cook, eat meals together, sleep comfortably, and enjoy the hot tub each evening. We were close to the Russian River, local stores, and other tourist sites such as Armstrong Woods and could get to San Francisco in less than two hours. It was exactly what we wanted for our family vacation! 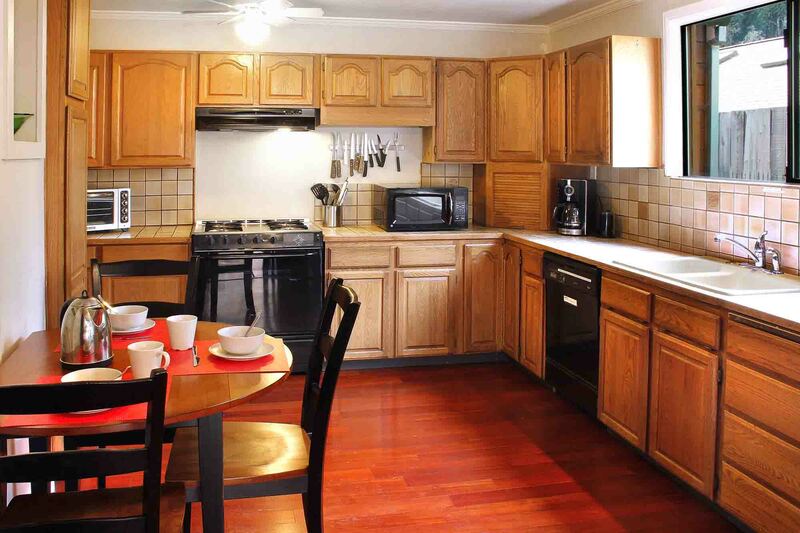 The River Getaways’s place was a very roomy home with a well appointed kitchen. Great spot! It served as a home base for a week of wine tasting and drives along the ocean. We cooked or barbecued every night. The kitchen was well stocked and easy to use. The decks and hot tub got used a lot. The house was plenty big enough for four of us to hang out. Highly recommended for anyone wanting a good spot to use while exploring the Sonoma Wine Country and Coast. "Overall, we had a really great experience"
Overall, we had a really great experience. Unlike some AirBnBs that claim to hold 10 people, we were easily able to fit all 10 of us comfortably. The outdoor space was amazing, if you are looking to hang out in the sun and do some barbecuing, I would recommend this place. Hi. Overall our stay was great. Bring wood with you to start a fire in the indoor fireplace. This house was great for a big group or two families. We all had a lot of space, it was a nice quite neighborhood and the location was very convenient. Also, communication with Emelyn was great and easy! Thank you for everything. Spacious house good for groups, fun hot tub/bbq setup and plenty of space to relax around the house. 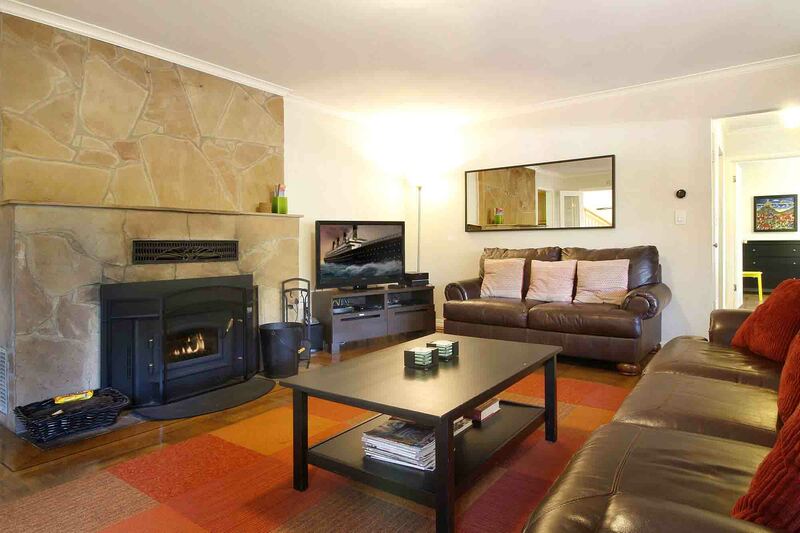 "Perfect for a weekend getaway from the city"
Perfect for a weekend getaway from the city. Great location for wine tasting! Mazzocco and Rochioli wineries were both with 15 min. Hot tub is enormous and well maintained. Perfect for a quick getaway. I booked River Getaway for a group of 10 of my closest girlfriends as a bachelorette weekend. I live in the Bay Area, so Guernville is not far, but when we arrived, it felt like a total oasis! The house is huge, conveniently located, well stocked with cooking utensils, and the hot tub was wonderful! 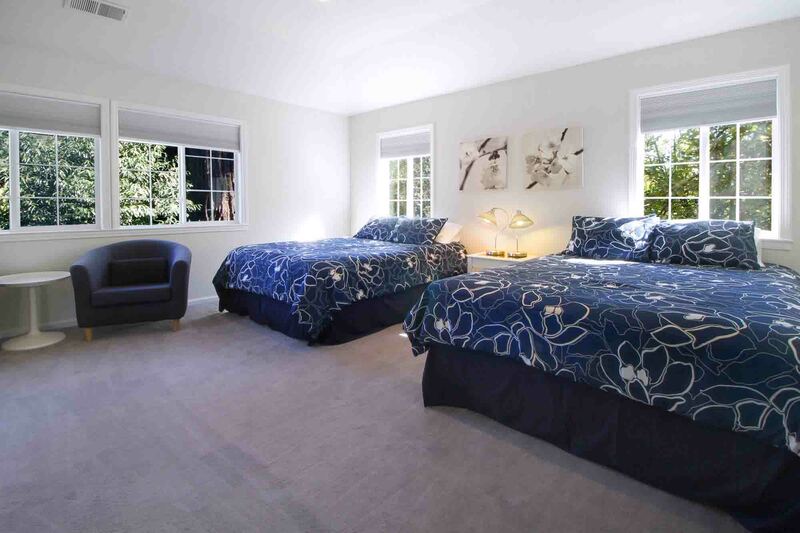 When we arrived, the house was totally spotless, and each bedroom was welcoming and comfortable. We were minutes from town and minutes from amazing hiking trails in a gorgeous redwood forest. It was heaven! Communicating with the hospitality company that cares for the property was easy and straightforward. We hope to return again in the future, because we had such a lovely stay here. 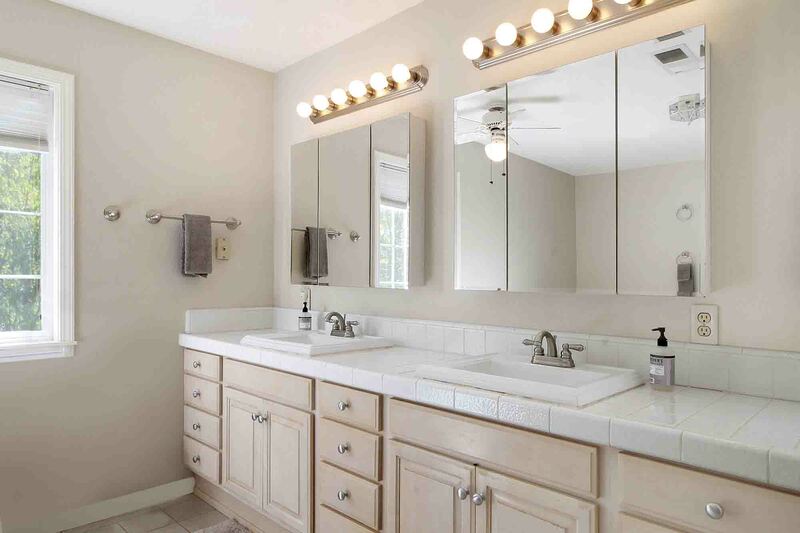 "Good location great family house 5 of 5"
Well equipped kitchen, great hot tub! Nice getaway, though a bit pricey. We shared this house with another family for 3 nights and still paid just short of $800. With that I expected updated bathrooms and clean and neat areas. Some of the tiles were cracked and we warned the children not to play in those areas. The upstairs was nice but we were the family downstairs and the bathroom downstairs was outdated and half mold around the bath tub. The location was very quiet and a great space for two families. The heater worked fantastically and was intuitive. The kitchen was perfect and we were able to easily cook multiple meals there. It felt very different once we were enclosed in the property versus being out and about around the property. The towels were a bit frayed, but clean and usable. Quite expensive but it have the kids plenty of places to explore to keep us adults sane. 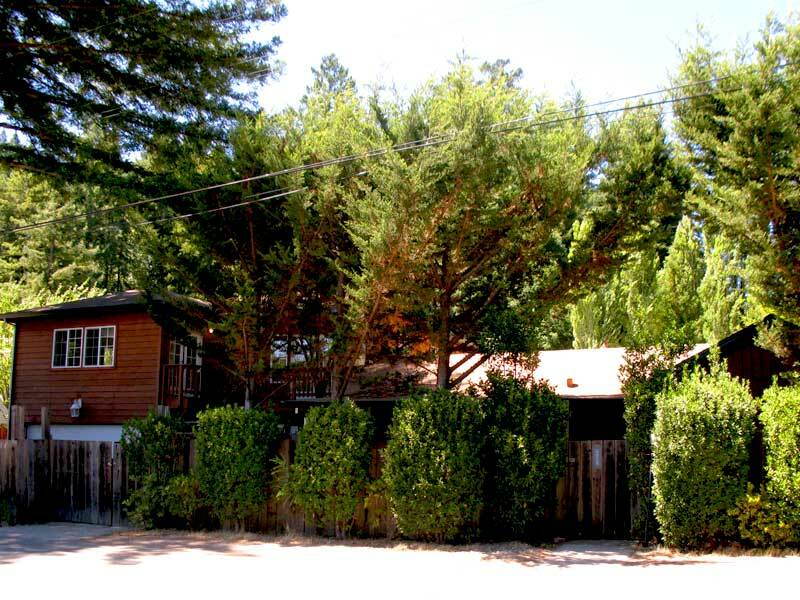 Great location 2 miles from "downtown" Guerneville to the south (including Safeway grocery store), and 2 miles from Armstrong Redwood State Park to the north. The house was comfortable and very well stocked with cooking equipment, including a nice new gas grill. The hot tub and patio area were very nice too. BYO consumable cooking stuff (spices, tin foil, oil, etc.). 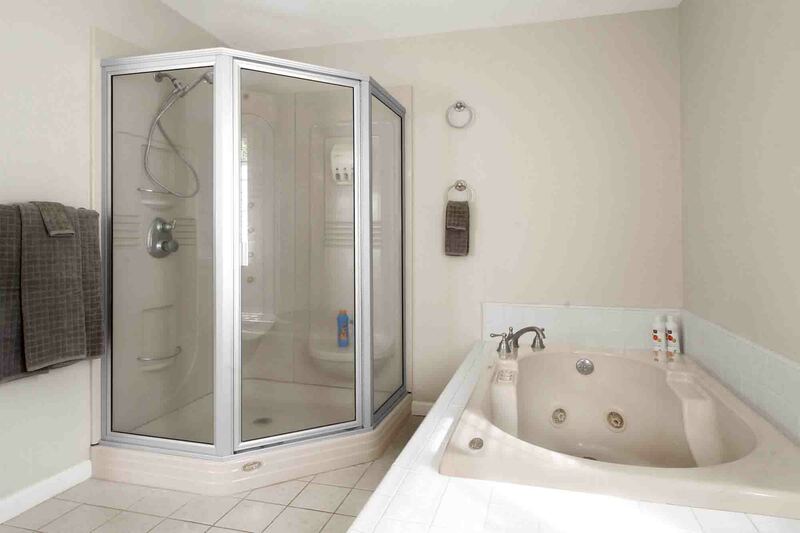 "Spacious and exactly as advertised"
This is a great house. The outdoor area is fantastic, and the inside is spacious and comfortable. Sleeps 10 fairly easily. We had a great time. This place is amazing. Pictures does. Or do it justice. There were many rules to remember but host made it easily available with signs around the house. Very spacious and comfortable. I would definitely recommend to others! Great place in RR for a large group. We enjoyed the deck, hot tub and the river. To start at the beginning, the directions and keyless entry were very convenient. The home was clean and larger than expected. The layout was great for several married couples. The kitchen had everything you could think of. The outdoor decks provided lots of different areas to enjoy. The place was wonderful. Weather was beautiful. The place was roomy. No one was in each others way. The place was quite and had everything we needed. We would stay there again. "Spacious, well-provisioned and organized home"
We enjoyed staying at this home for 3 nights, with 6 adults and 2 toddlers. The property is as described and we found the various spaces even better than we were expecting. Kitchen is well-stocked with equipment and tools. Gas grill and hot tub were both great. Management company lent us 2 pack-and-plays which were super helpful too. We would want to come back! We were a group of triathletes and supporters (10 adults and 1 infant total) in town from SF for a race in Santa Rosa and Great Escape was perfect! The house was spacious, well maintained, and comfortable. 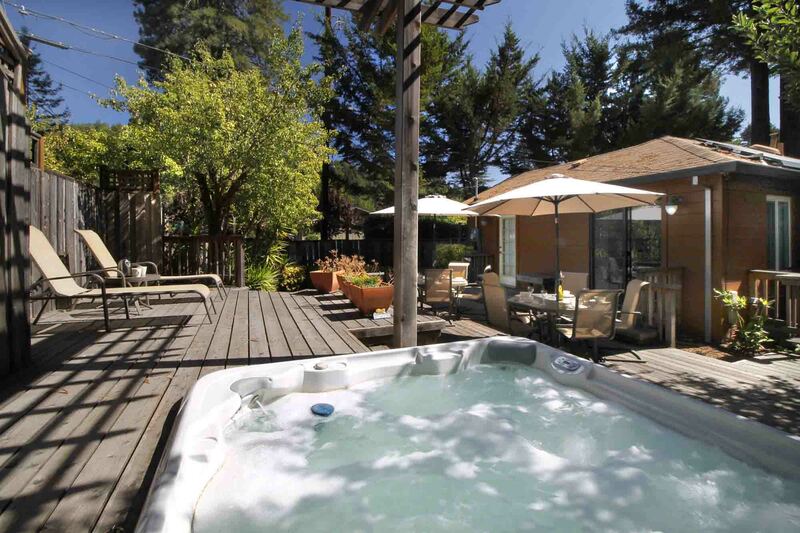 The patio and hot tub were perfect for hanging out and relaxing and the location close to Guernville was super convenient. "This was a great space and fit our group of 11 comfortably"
This was a great space and fit our group of 11 comfortably. 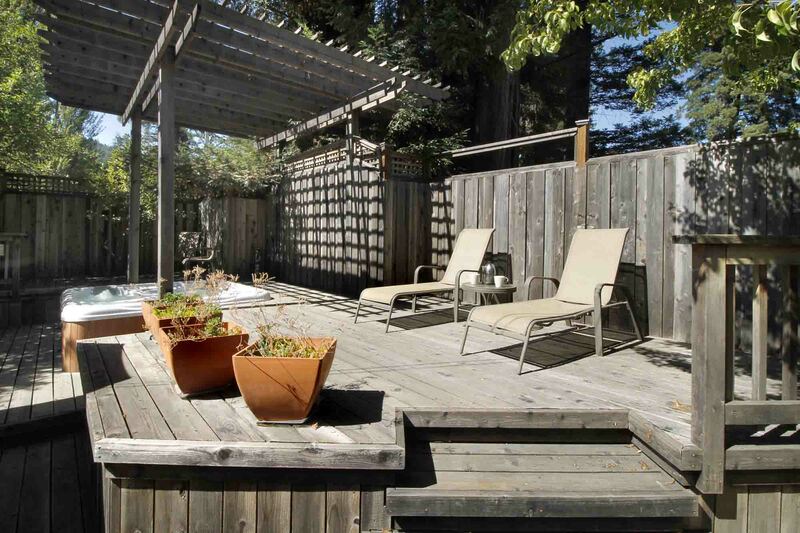 The outdoor space is incredible and mostly private, despite being in a neighborhood. 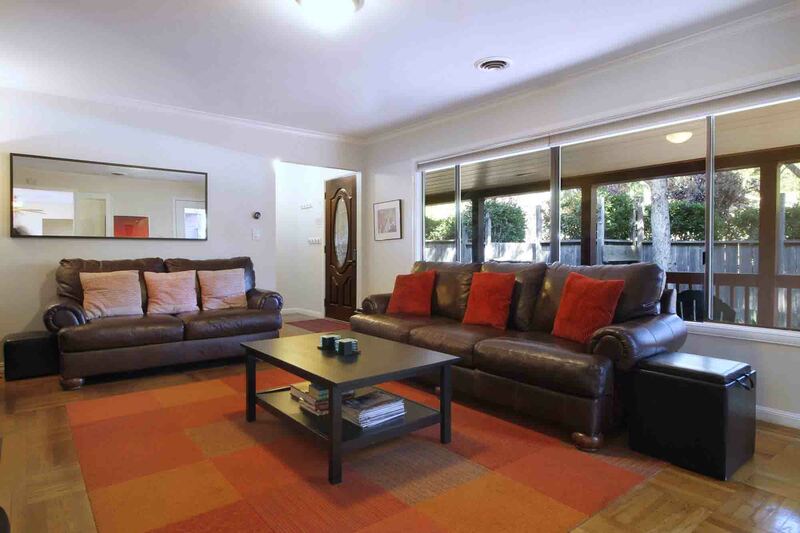 The house has plenty of common space and lots of different rooms - great for a large gathering of people. I highly recommend this space! "Great spot and location. Ready for families"
Perfect for a group that wants to cook, hang out on the patio and relax in the hot tub. Would love to stay here again! 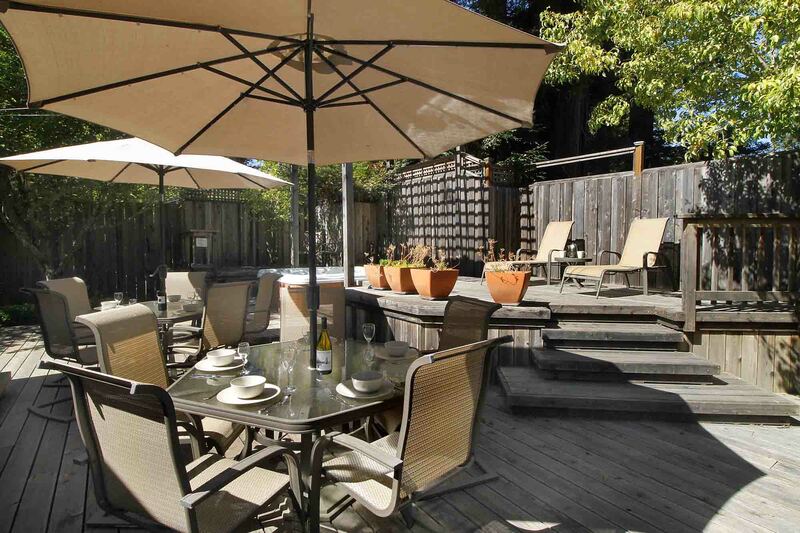 Really nice place for a stay if you're visiting the Sonoma valley. It's very spacious and comfortable, the kitchen has everything you need for preparing food, it was clean, and in a quiet neighborhood (not a secluded spot, and quiet hours are imposed). It would sleep four couples very comfortably, but you could sleep an extra three if willing to share space. The management company communicated everything effectively, and check in/check out was as easy as showing up on the first day, and walking out on the last day. Would recommend! Great location and huge house! Great getaway spot. The house is huge, very well kept, and just around the corner from downtown. Quiet location which is perfect for a get out of the city weekend and more. Would definitely rent again! "Great space for big groups"
This house has so much room, great for big groups! Children's toys are an added bonus! Wish I knew so I didn't pack any! Very spacious and wonderful amenities! 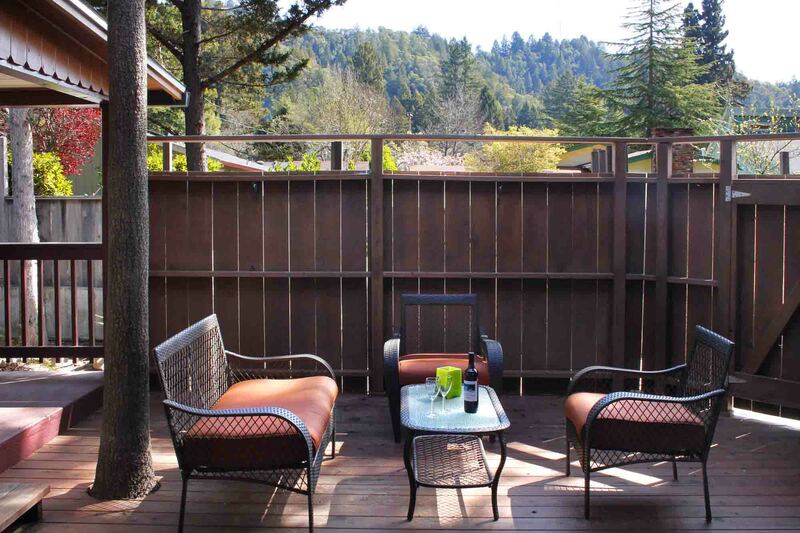 The house is also about a 5 minute drive from popular destinations such as Armstrong Redwoods and Downtown Guerneville, so that was very convenient. We had such a wonderful family trip to Guerneville! The house was spacious and lovely, and we have already talked about making this an annual trip! We cooked a huge thanksgiving dinner and the kitchen had all the pots, pans and roasting pan needed. First rental home that had everything needed to host a great sit down dinner! Very comfortable for 10 adults! Our families had a great time at this property and it was really close to town. The house is very roomy and the kids loved the all the space both indoors and outside. Great property with amazing outdoor area and space for dinner. Beautiful setting surrounded by redwoods. The home was beautiful and very spacious. Lots of great toys for the kids and very generous with amenities provided. Neighbors were quiet & surrounding area is wonderful! Great place! Would definitely recommend it. We absolutely loved this house. My twins are still talking about 'the Russian river home' thanks to the toy kitchen and books. There was more than enough space for our party of 7- we were amazed by how large it was! Also the kitchen was well equipped and the hosts made navigating the rental and amenities very easy. "Had a great stay! " The property is about a 10 min walk from downtown which is awesome. The street is quiet surrounded by trees. The home is beautiful and well maintained. All the instructions are easily accessible in the binder in the living room or via your smartphone. 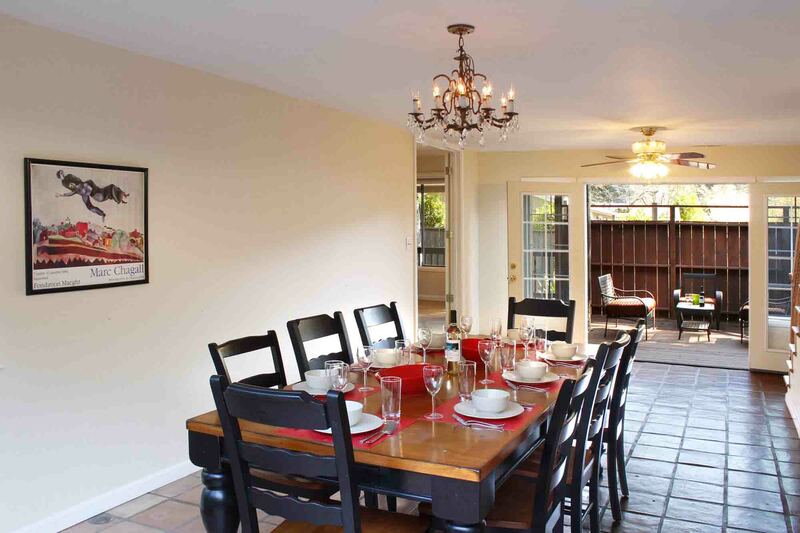 The house is spacious with a large dining area for brunch/dinners. 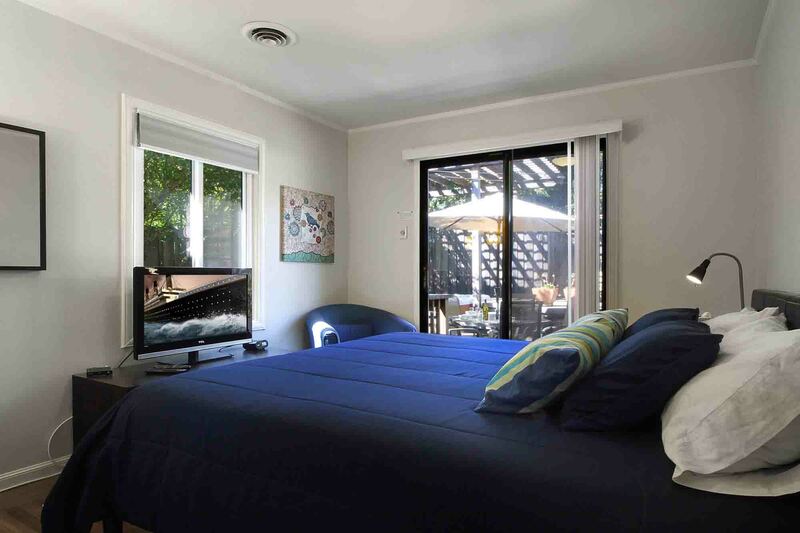 This is my second stay at this property and it is the one place I prefer to stay when I visit Guerneville. If you're looking for a place where you and several friends/family members can stay together and get away, this is the place for you. 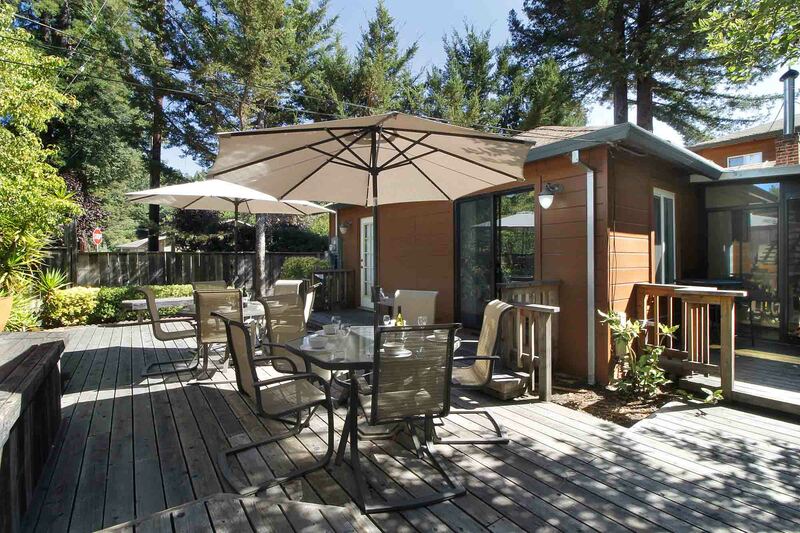 Pro's of the stay: Quiet neighborhood, lots of sun on the deck, great outdoor areas. Con's: Weird house layout with 29 doors, strange interior spaces, strangely giant bathroom, small kitchen, and no bathrooms directly attached to bedrooms. Also, the BBQ was very worn out and needs replacing. Overall we felt it was a bit overpriced for what you get. I can not say enough good things about staying in this lovely home! We had a large party, 8 people, and it was the perfect size - in fact there was room to spare. The patio area was a wonderful place for all of us to hangout, and the hot tub was big enough to fit us all. 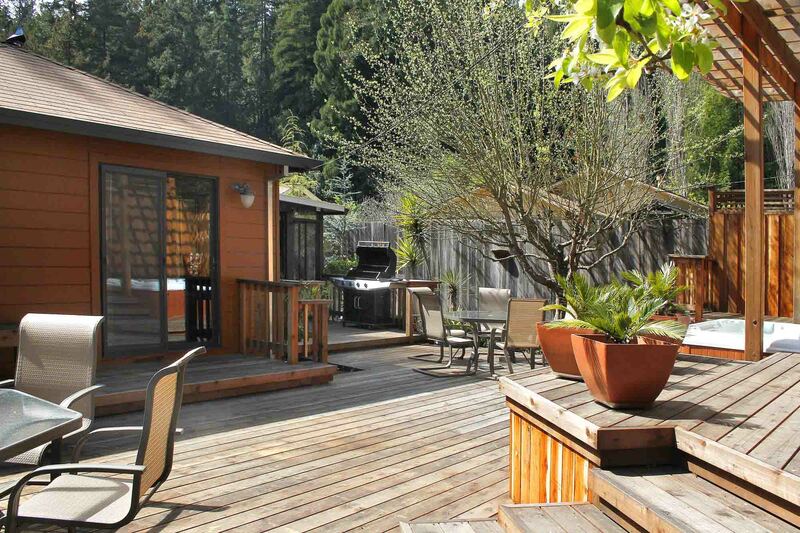 We enjoyed our weekend in Guerneville very much. Had a chance to visit some local restaurants and bar....everyone was very friendly. The house was excellent for our group of 8. I appreciated that there were very clear instructions on how to work or find anything we needed....well equipped. The neighborhood was very quiet and relaxing, the backyard excellent for an evening outdoors. The house is nice and big for large groups. And the deck/jacuzzi area was perfect for hanging out and bbqing and entertaining. You can walk to town, and we did, but it takes about 25 mins. It's flat though and you get to walk along a creek bed so it's beautiful. All in all we had a great time and the house was awesome. The house was great for our party of 10 adults and 2 dogs. It was very conveniently located close to the main street. The kitchen had everything we needed to cook large meals, including spices and miscellaneous supplies. The listing suggested kitchen sponges, hair dryers, and beach towels might not be included, but they were provided for us. There was enough outdoor space for everyone to have an al fresco breakfast on the deck. The house is also only a few minutes drive to Armstrong Redwoods State Reserve. Great for a hike! Beautiful and comfortable home with everything we needed for a great stay! "Huge, Spacious, and Well-equipped Home"
Spend a great weekend at the Great Escape house with some friends and had a lovely time. The place was huge with numerous little areas to relax in...some in the sun, some in the shade, some indoor, some out. Whatever time of day, you could go to an area of the house that was comfortable. We spent most of our time on the spacious deck or cooking in the well-equipped kitchen. As far as the bedrooms, two smaller ones had direct access to the deck and hot tub, and the other two larger and more modern ones were on the opposite side of the house, upstairs. 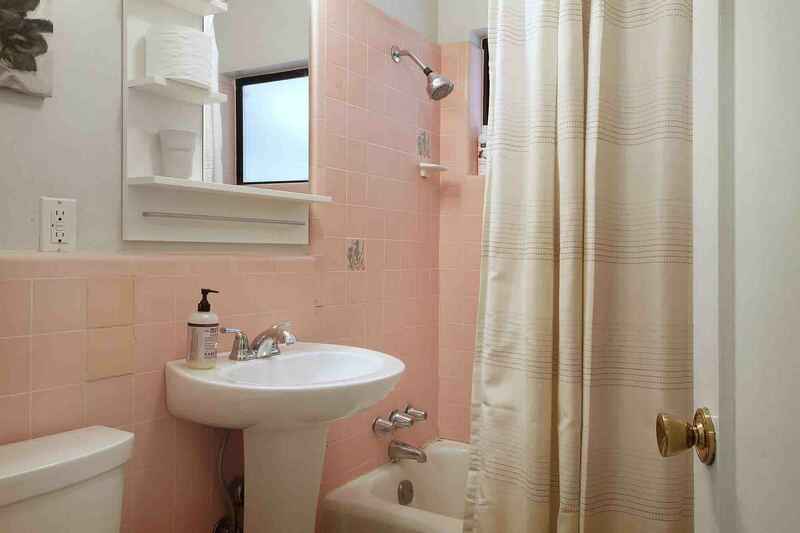 The upstairs bathroom was larger than some studio apartments in San Francisco and had a multi-jet shower and deep jacuzzi tub. Overall, the layout of the place felt like one older and one newer house were conjoined by the sunken tile dining room.The location was great. 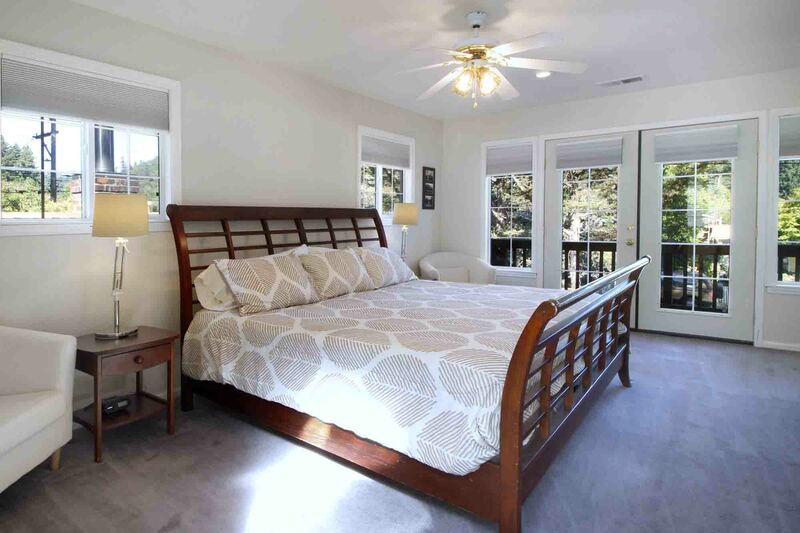 Located between Armstrong Woods and downtown Guerneville, so it look only a few minutes to drive to either location. And it's dog friendly!We had a great time and all felt that we'd like to return to spend more time here. "Gorgeous Spaces for all our Needs"
We rented Great Escape for a calm girls weekend in celebration of my sister getting married. It was the perfect place for us! We enjoyed dining in the large dining room, eating lunch on the front porch, having morning coffee in the sun room, soaking in the hot tub, and lounging on the warm deck in the day. Everyone slept well and felt comfortable in their space. When we did motivate to leave the house, we were rewarded with delightful walks in the redwoods, happy hour at the local wine bar and beautiful times at the Russian River - all very close by. All the ladies said they would love to come back! This lovely cottage home was the perfect blend of old and modern. The space and separation of the bedrooms gave new parents a quiet area, and we were all happy with the quality beds. Pillows were not very good, just too big and firm. The hot tub was clean, hot and full of wonderful jets for every seat. We all enjoyed it in evenings and mornings and the private spacious deck was the greatest spot for reconnecting with family from New Jersey. We will be back to explore again the river and funky dining in Guerneville, as well as enjoy the spa, great bbq, and fabulous family home. Thank you for appointing the home so well. Great Escape is like a home within a home. We're glad it worked out so well for your family and you enjoyed the spaciousness of the home and deck. Being only a little more than a mile from downtown Guerneville makes it great home base to explore what our river area has to offer. I brought my family to this house for Thanksgiving, we had six adults, three small children and three dogs. The house accommodated us all very comfortably. The kitchen was well equiped and had everything we needed for cooking. Everyone enjoyed the hot tub and patio. The location was great for walking to town and the Redwoods.